Hoodmaster Fire Prevention LLC is a leader in the Fire Prevention industry Servicing NJ & PA, We take Pride in our Specialized work. Cleaning Exhaust Systems as Per NFPA 96 Code. 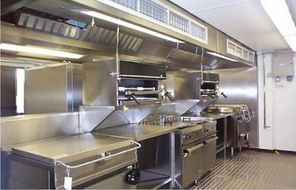 Our work gets approved by State & Local Health Departments as well as by Local Fire Inspectors & CESI Inspectors. We look forward to working with you. 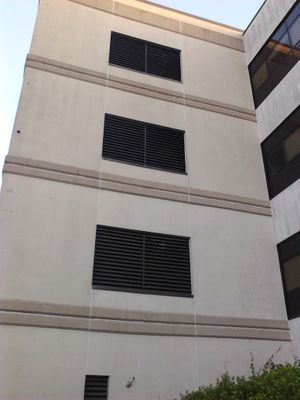 Hoodmaster LLC is Based out of Central Jersey and Services All of NJ & PA. Our Customers range from Healthcare facilities such as Nursing Homes, Rehab Centers, Assistant Livings Adult Day care & Specialty Hospitals to Restaurants Schools and Government Centers as well as Residential Hood Cleaning. 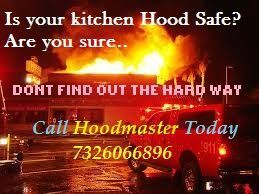 Hoodmaster Fire Prevention Serving New Jersey and PA. uses industrial hot water power washers and degreasers so you know you are getting a professional cleaning job on your kitchen hood and grease traps. Our company takes every precaution to cover and protect all exposed items in work areas and upon completion of service, have entire work area as spotless as, if not more than, when we came in. Floors are mopped throughout the work area after every cleaning. 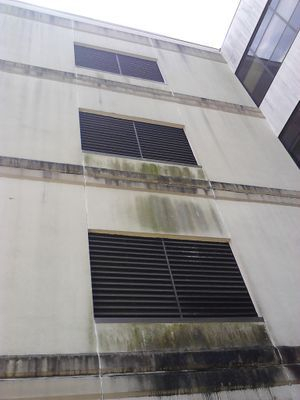 We provide any service you may need in regards to pressure washing and hard floor maintenance. Our flexible and friendly crews will assist you in all your cleaning needs and give you valuable experienced based opinions and ideas. 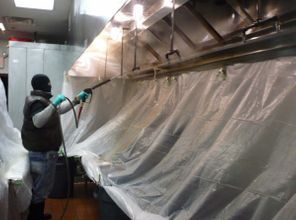 Hood Master cleans to NFPA 96 standards. First hand knowledge of new technology and code changes are a priority to providing our customers with quality and professional service. Our company takes every precaution to ensure our work areas are thoroughly protected. Our staff hangs plastic around the base of the hood and over all appliances so water, grease and debris extracted during the cleaning process are diverted to appropriate containers and drains. We guarantee your kitchen to be as clean, if not cleaner, as when we arrived. Fans are opened and cleaned on the inside and out, the rooftop directly surrounding the fan is cleaned and rinsed to ensure grease removed from the fans is not left on the roof. All accessible areas of the duct are cleaned from the roof down and from the hood up. Floors are scrubbed and mopped after every service. Our trained technicians use 3,500 – 4,000 PSI, heated water machines. A powerful, chemical degreaser is used that is specifically formulated to degrease exhaust hoods, filters, ducts and fans and is safe on all hood systems materials. The U.S. Consumer Product Safety Commission (CPSC) estimates that 15,500 fires associated with clothes dryers occur annually. These fires account for an average of 10 deaths and 310 injuries and more than $84.4 million in property damage annually. 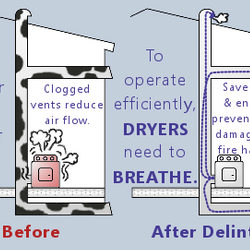 Dryer vent fires are more common than chimney fires. 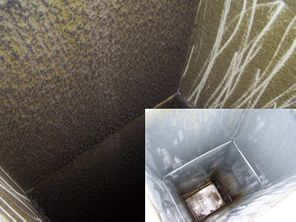 Flammable lint, and dirt and dust accumulate quite rapidly inside the dryer vent (the lint screen does not catch all of it). 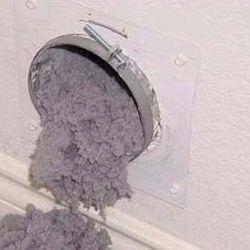 It is recommended that dryer vents and the dryer chassis be cleaned out every 3 - 6 months depending on the extent of the use of your dryer. Commercial dryers need to be cleaned more often. 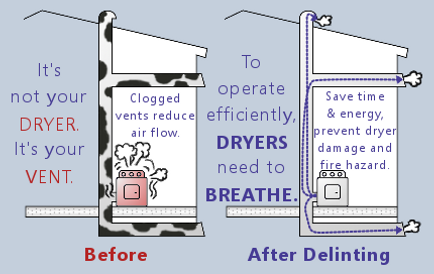 Symptoms of a clogged dryer vent include excessive moisture in the laundry room and clothes take a long time to dry or won't dry at all. 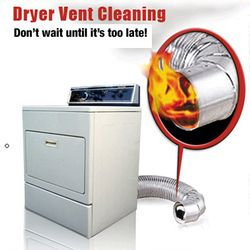 Cleaning the dryer vent will improve drying time. Depending on what type of dryer you have - stackable, side-by-side, gas or electric - and how your dryer is vented - through the wall, up through the roof, across the inside of the ceiling, etc. - the basic procedure is the same. 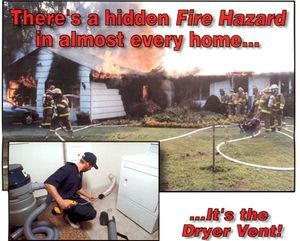 Poorly maintained dryer vents cause fire hazards and cost you much more money to operate your dryer. Steam Cleaning Kitchen Floors, Bathrooms, Showers Etc. Tile cleaning is one of our main services we provide. Even In the most extreme situations our tile cleaning process brightens your tile and restores your grout to its original color. We offer tile cleaning grout cleaning and tile restoration services on all type of hard surfaces such as ceramic tile, Mexican tile, porcelain tile, terrazzo floor’s, travertine, marble, granite and almost any other type of stone or tile. What ever your flooring is we can clean it. 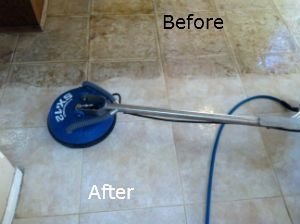 We offer 100% satisfaction guarantee on our tile cleaning service. 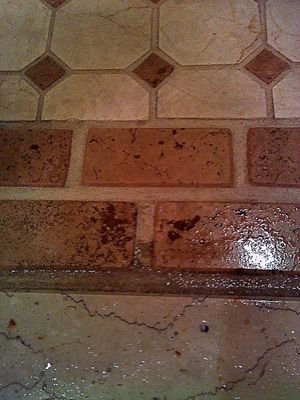 We offer tile and grout steam cleaning services. Our professional tile and grout cleaning will get your tile up to par. You won’t believe your eyes when you see the difference in your floors! Not only will Hoodmaster Cleaning have your floors looking good, they will be disinfected as well. We make sure to get out the gunk that gets stuck in your grout. We will make your floors super clean and sanitized. We will have your tile floors looking like new in not time. Schedule your tile and grout cleaning today! Grout quickly fades as time passes, simply by absorbing spills, mildew, and a constant barrage of dirt and moisture. Tile also often suffers from a "dulling" or "dingy" effect after prolonged use. We can help restore your tile work to its original glory by deep-cleaning the dirt and dust out of all the tile's crevices and pores. Our equipment is specially designed to effectively remove virtually all of the built-up grime from your tile work. Contact us to restore beauty and sheen to your home's tile. To ensure your satisfaction, we provide a free, no-obligation estimate by phone or request form. We can dispatch a technician to your home for a more detailed estimate at no cost of to you. This will allow you to show our technician the areas you would like cleaned, as well as any problem stains or spots. The technician will provide you with an exact estimate, and if you choose to proceed, the technician will immediately begin working. There is no obligation to use our services, and we will never pressure you. 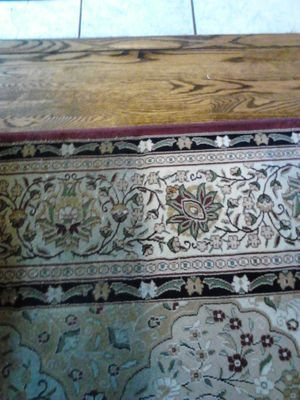 Carpet Cleaning The Hoodmaster difference"
he Difference is Night and day! 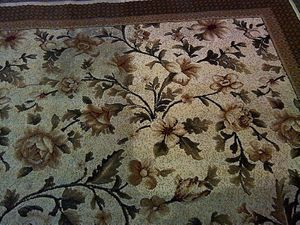 Any Carpet Fabric or Upholstery Cleaning is our specialty . We are there to Wow! our customers. Couches, Cushion chairs, Steps of any room or Oriental Rugs. Wherever it may be you can count on Hoodmaster we can clean it. Our service is absolutely essential to the long-term survival of your carpet. In fact, many of the top carpet manufacturers recommend regular steam cleaning for their products. To ensure that your carpets are cleaned of even the most ground-in dirt and grime, we use state-of-the-art, truck-mounted equipment . This equipment has revolutionized carpet cleaning by breaking down the dirt on a chemical level, while instantly vacuuming it away. The result: cleaner carpets without the inevitable wear-and-tear that most cleaners leave behind. This keeps your carpets cleaner for longer periods of time, as well as prolonging the overall life of the carpet! While the answer depends on the amount of foot-traffic, pet ownership, number of children in the home, and other factors, most homes should have their carpets cleaned at least once year. However, we typically recommend a cleaning every 6 months. This will ensure that your carpet stays clean and fresh. Additionally, this will keep the total amount of microorganisms reduced; most carpet is laden with a variety of these organisms as a result of food spillage, dust mites, soil, pollen, and bacteria. By removing these allergens and organisms, your indoor air quality will improve. 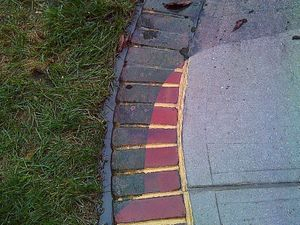 Professional Power Washing & Pressure Cleaning Services in Monmouth, Ocean, and Middlesex Counties in New Jersey. Mold removal is what we do best. We specialize in removing mold using our hot water pressure washers, which ensure that your home is safely cleaned using the right combination of temperature and pressure. 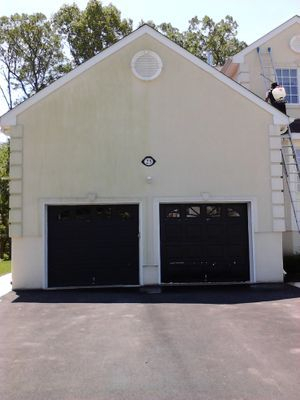 Rather than just blasting away at your stucco or vinyl siding, we use a process called soft washing. This simply means that we invest in the best house washing detergents that allow us to properly wash your home. Not only do they remove the mold and algae, but they also prevent it from coming back for a much longer period of time. We also offer gutter whitening service.